I’ve never been a big fan of hills…ever! As a matter of fact, I try to plan my runs to avoid them as much as possible (guilty as charged) and I stick to flat surfaces. My high school track team practiced in a particularly mountainous area of Hong Kong (the whole island is just little mountains really) and on hill workouts I would do everything I could to get out of it – fake sick, get a side stitch, claim dehydration. If any of my high school track coaches read this, please consider this an apology. But seriously…this was the area around my school (pictured bottom left)! Holy Hills Batman! Pretty? Yes, but you had to run up a hill just to get out of the gates! This brilliant avoidance plan of mine, however, did not make me any faster…and I want to be faster! Everything I have read has pointed me towards hill running and interval training. Last week I kicked it into high gear (pre-snowstorm)! The theory is pretty basic: if you want to improve strength and speed, run hills. 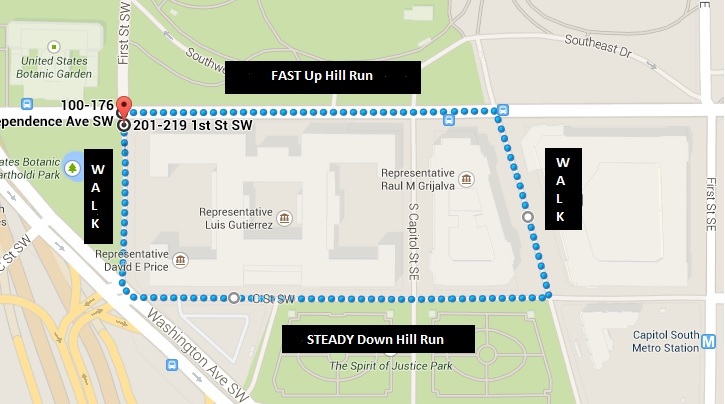 We live in Capitol Hill so there are plenty of “hills” to choose from (ok really only 2 big ones). There is one hill in particular (pictured below) that I went out of my way to run up during each run this week. I wanted to focus on hill intervals (aka repeats) this past weekend so I set of goal of running it 4 times in one run. Run up, down, up, down, up, down, up down…you get the point. 4 was my goal and 4 repeats were accomplished. Now I have my base-lines! 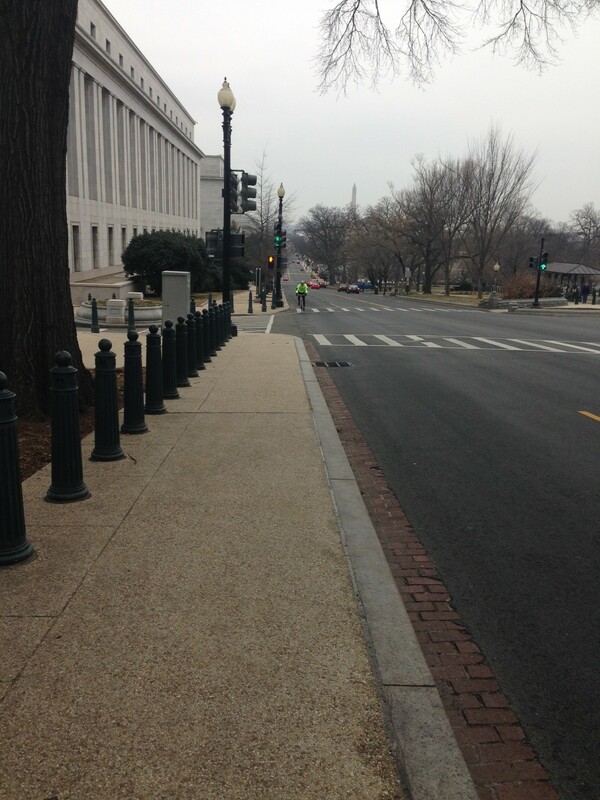 And Capitol Police think I am crazy! Over the last few weeks I have read several articles on hill intervals and I wanted to share them with you. A study out of New Zealand confirmed the theory that hill training makes you faster. 20 well-trained runners were tasked with running a 5k at their best times possible. Next they trained on hills for 6 weeks and ran the same 5k course to gage improvement. Each runner was (at least) a 2% improvement. That’s PR territory right there! If you want to increase the amount of calories you burn and don’ t have an hour to add to your workout time, add an incline! On average I burn 100 calories/mile on a run. On my 4 mile hill intervals this weekend I burned over 500. Check it out! According to Runners World, on uphill sections your muscles contract more powerfully than usual because they are forced to overcome gravity to move you up the hill. The result is more power, which in turn leads to longer, faster running strides. Shift gears both mentally and physically and prepare to attack the hill; don’t let it attack you. Each repeat gets stronger and you’ll feel like a beast when it’s over! As your endurance builds, it will also make the flatter portions of your runs easier. Hill actually lessens the risk of injury because the slope of the hill naturally shortens the distance you have to “fall” and lessens impact. The reverse is also true…so be careful on downhills! So what do I do on these hill runs? Side note, I like to begin is a 10 minute run to warm up before I get to my hill to make sure I’m ready to go. Maybe hill intervals are not your thing? No problem! There are other types of “hill runs” to take a look at as well: short hill repeats (think 30-60 meters long), long hill runs, hill bounding, downhill strides, etc, you just have to play around and figure out what works best for you. What are your thoughts on hill training? Share them in the comment section below! I really need to try hills but where I live in FL, we don’t have any! I’ve heard stories of people who live in flat areas running in parking garages as hills! Indeed we do. I’m in Florida as well. No hills whatsoever, so parking garages and, since I live near Jacksonville, we all run the bridges which cross the St. Johns river. That’s as close as we have to a hill I’m afraid. When I lived in hill country, eastern Tennessee, I too did my best to avoid hills and planned my runs around the worst of them. Pathetic me! I’d love the opportunity to run some now.